As I take in the blackness of a new moon sky, the newly cold air snaps at my nostrils, the smell of piñon soothes. Coyotes sing with canine accompaniment. Years ago, desperate for relief from grief, I fled from New Mexico back to my first home, a crumbling postindustrial city. I found the remains of a life that used to be, full of memory, but lacking feeling. The days spent with friends at Milford Beach and family cookouts were gone, replaced by lapsed friendships, bad food, and tracksuits. In the green hills of the southern Adirondacks, I couldn’t see the wider vistas. Finally, I understood why I had come to New Mexico 20 years ago, to a place I felt but couldn’t touch, a place where a woman can be herself, can ride a horse. There is something about the mountains and this sky that lets me breathe. They take every struggle and push me in deeper and closer to what matters. Alone and writing, right where I am, right where I need to be. In the summer of 2002, during my third road trip to New Mexico from Toronto, I visited Chaco Canyon with a friend. This time, our hiking destination was Peñasco Blanco. It was a challenging and rewarding hike. On the way back, during the late afternoon, we stopped at Pueblo del Arroyo for a rest and to watch the sunset. We became aware of the distant sound of music … a flute, perhaps? Back at the visitors’ center, we inquired about the flute. Was it a special occasion? They were not aware of any flute music, and there was no special occasion on that day. I know I heard the sounds; I was immersed in the magic that is New Mexico. It was an Aha! moment I will never forget. While on a silent writing retreat at the Mabel Dodge Luhan house, in Taos, I sat in contemplation at the end of my day while writing at the small desk in the Georgia O’Keeffe Room. The two French casement windows, which face the Taos Pueblo lands, were open, and a gentle summer evening breeze moved the lace curtains. I began hearing a very distant sound and I wasn’t quite sure what it was. I came to realize that it was drumming at sunset on the Taos Pueblo. I put my pencil down and sat quietly until it was dark, and then listened to the Taos night sounds. When I was 18, I was accepted at Brooks College, in Long Beach, California. My father and I drove from my home in Michigan. One of our stops was Gallup, where we stayed overnight. It was 1979. As a child, I had always had this love of Native American things; I am Lebanese and Ukrainian, so I don’t know where it came from. When we stopped in Gallup, something just came over me and I felt like I belonged there. I can’t explain it, and I will never forget it. I told my dad that I would be back there one day. I am now 53, and still in the Michigan home I grew up in. I did go to Santa Fe a few years ago, and the feeling of belonging in New Mexico was still there. That is why I subscribe to this magazine! 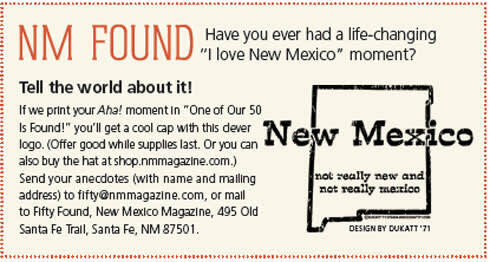 I love everything about New Mexico, and I know it’s never too late to follow your dream or your heart. I moved to Taos in 1971. It was January, and the mountains were full of snow. Sitting in Dori’s Bakery, I shared my worry about whether I would be able to make a living in Taos. Just then, Frank Waters, the famous writer, jumped up and asked me to go outside and look at the Taos Mountain and tell him what I saw. I said, “The dark shadows look like a man by a campfire drinking a cup of coffee.” He looked at me, put his hand on my shoulder, and said, “Don’t worry. You will make it here.” He was right. I spent the next 30 years in New Mexico. Several years ago, my son and I agreed that New Mexico was the place to relocate. We looked at numerous properties. At one, we stood on the side of a pine-covered foothill, looking across at the Sangre de Cristo Mountains. We knew it was the right spot, because we were both awestruck, silent, and simply in the moment. While it will be a few years yet until the building of the house will begin, we visit the property regularly and soak up the pristine beauty that is New Mexico.